teetering on two options… septum sways me towards timid sub-Saharan species? At first the relatively short and broad skull made me think alligatorid, but its got the notchy-toothy business going on where the fourth tooth in the lower jaw fits in a notch in the upper jaw, and the skull is generally more V-shaped than U-shaped. So its definitely a crocodilid. So the relative shortness and broadness might be because its a juvenile. Although I think that would be a little unfair if you’re looking for pointers to get down to species level. So picking up on Cindy’s hint, I’m wondering if its an adult and there’s a bit of paedomorphosis in its evolutionary history. I’m going to guess Caiman yacare. I’m with Alexandre on the group, though haven’t a clue about species. Thing is, I have noticed these crocodilians always seem to carry their heads higher rather than in line with their bodies like other crocodilians, so their necks, while not s-shaped, definitely have a bit of a bend in them. Consequently, I guess, the attachment point of skull to vertebrae would be more ventral, I think. 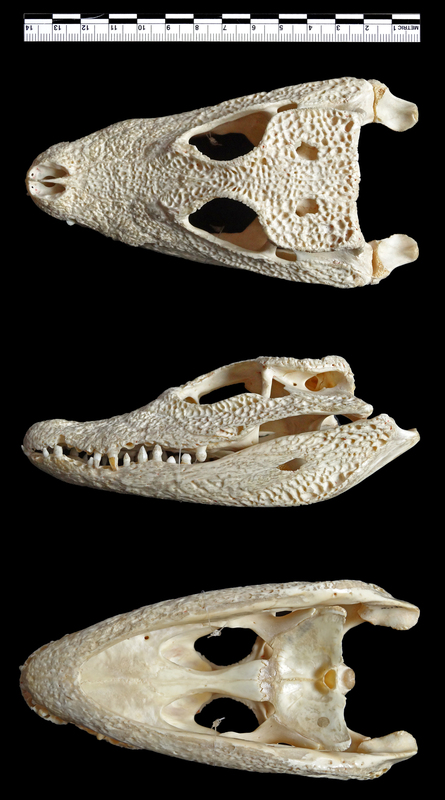 In any case, the shape of the skull, including the slightly retrousse end to the snout is totally, in gestalt terms, a match for that particular group of crocodilians. I’d say the common variety if I had to guess. Is a dwarf crocodile too obvious?